The golden rule of marketing is this: know your audience. Know everything about them. Know what keeps them up at night. Know their hopes, fears, dreams and ambitions. Learn the challenges they face and the tools they use to solve them. In short, empathize. Empathy is the only way for marketers to build campaigns that resonate. If you’re not speaking an audience’s language, you’ll be ignored. No seasoned creative professional would consider this sort of research a waste of time, but creatives aren’t always in charge. Time spent getting to know an audience could be spent building creatives or analyzing campaign data. This can make it difficult to justify to managers who prioritize hard numbers like CPA, LTV, and ROAS. It’s a contrast that some may find frustrating but ultimately creates the kind of productive tensions that build successful businesses. The irony is that empathy for an audience is integral to hitting performance targets. By developing a deeper understanding for their audience, marketers learn their audience’s intent at every moment across every channel. Knowing an audience’s motivations at the moment an impression is delivered can be an immense advantage when developing campaigns. Consider a basic search ad. What is a user’s intent at the moment a paid result appears? What do they want? More than likely it’s to answer a question and/or find information related to their search query. They have a goal, albeit a short-term one, that they’re trying to achieve. Instead of taking that moment to interrupt their efforts with information about your product or service, an empathetic marketer would build a campaign that puts the audience’s needs above their own. If that campaign solves their problem, it’ll get the click. Simple as that. 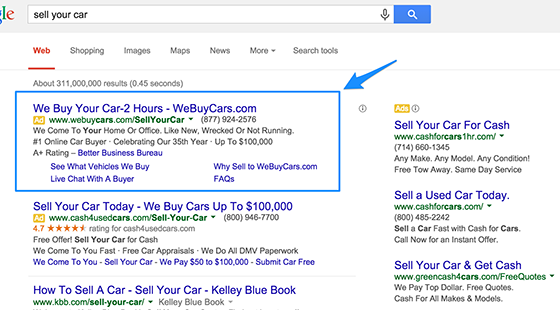 Take a look at the following search campaign for a U.S. car buying service. The campaign not only addresses the customer’s immediate goal (to sell their car) but shows consideration for customer needs not even suggested by the search term. It promises a turnaround time of no more than 2 hours and explains that the service will come directly to your home or office. This is an incredible value add and shows consideration for the fact that someone selling a car may have limited transportation capabilities. These are the kind of insights that come from empathizing with your customers. The above campaign also doesn’t waste a single word on personal branding. Every letter addresses the customer’s needs, which is a stark contrast to the following campaign. Not only does this campaign fail to empathize with the customer, it wastes precious real-estate alienating potential customers by stating that they don’t do businesses with younger audiences. They prioritize their own branding at the cost of connecting with a customer’s immediate intent, making for an overall weak message, unlikely to earn the attention of its intended audience. Empathy is equally important for visual mediums like Facebook, where audience intent can differ. Multiple surveys suggest that the most common reasons modern audiences use Facebook are to learn about live events, discover new products, read the news, and of course watch cat videos. All of these motivations are far less goal-oriented than a search user. They’re exploratory, meaning that if someone’s on Facebook, chances are it’s because they’re hoping to discover something new and entertaining. As an advertiser, it’s up to you to deliver campaigns that harmonize with that same sentiment of leisurely discovery. Jonathan Taylor of Klipfolio describes how his team struggled with this when they first started advertising on Facebook despite their explicit goal of being a considerate advertiser. He describes how, at the outset, his team labored over campaigns that would start to perform poorly after only a few days in market. Thankfully, it didn’t take long to figure out why. “We were saturating our audience with the same ad, over and over. This was the opposite of our compassionate advertising strategy.” The moment his team empathized with their customers and recognized what they were submitting them to, things got better. They were able to determine that “ad frequency and click-through rates are closely tied. When ad frequency rises, your CTRs will plummet.” He quickly determined that an ad frequency of 4 or higher meant that their CPAs were at risk, and that changes were in order. By instituting some powerful shifts in creative process, Taylor was able to avert disaster and get his CPAs back on track. His team began refreshing creatives almost weekly, always conscious of keeping customers entertained and delivering fresh content before customers got bored. “Refreshing your creative on a regular basis is a necessity. I made the mistake of thinking I could wait until ad frequency started to rise; I couldn’t have been more wrong. Waiting until the last minute is like trying to add a dash of baking powder into your cookies after you’ve already mixed the batter.” Thanks to Jonathan’s ability to empathize with his audience and prioritize their experience, his team was able to increase campaign and landing page conversion rates by as much as 16%. No matter what challenge you’re facing as a marketer, it can almost always be solved by learning more about your audience. After all, they’re your real bosses. If they’re not engaged, you’re not doing your job. So, know your audience. Know what they go through every day, at work, at home, and in their personal lives. Know what frustrates and delights them. Know what they’re going through at any given moment, and you’ll be able to build campaigns that fuel rapid growth, no matter what you’re selling.